Rich Cowley of Geneva presents Arlene Francis, Boys & Girls Club of Geneva Executive Director, with a donation toward funding operations at the Geneva Community Center. Pictured, from left to right: Nancey McCoy, Michele Cowley, Rich Cowley, Arlene Francis, George Fairfax. 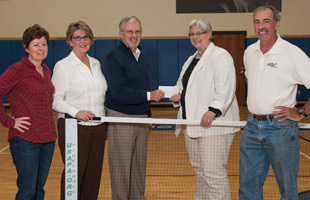 In September, athletes from the western/central New York regions gathered at the Geneva Community Center to compete in a pickleball skill level tournament to support the Boys & Girls Club of Geneva. The fastest–growing recreational sport in America, pickleball is a paddle game played on a badminton court with a special perforated ball. Easy to learn, it can be a fast-paced competitive game among experienced players. With all of the money coming from team entry fees paid by the competing athletes, the tournament once again exceeded the Club’s donation target. There were 26 teams from the greater Rochester and Syracuse metropolitan areas, New York’s Southern Tier, and local Finger Lakes communities. The competition was fierce and the sportsmanship outstanding; medals were awarded to the top three teams in each division: adult, the masters, and the open mixed doubles. The bronze medal match featured two teams that play regularly at the Carter Road facility. George Fairfax of Geneva and Mary Hamm of Rushville faced off against Rich Cowley of Geneva and Vanessa Nye of Seneca Falls in the open mixed doubles competition. George and Mary jumped out to an early lead that looked to be insurmountable. But, Rich and Vanessa hung tough and eventually clawed their way back to a narrow two point victory. The match ended with congratulations and hugs all around. Both Rich and George have worked hard for the past three years to bring pickleball to life in Geneva. The prospects for continuing this fundraiser for the Boys & Girls Club of Geneva in the years to come are promising. With the support of community partners such as the Geneva School District and the Alliance of NYS Boys & Girls Clubs who secured critical statewide funding, the Boys & Girls Club of Geneva has fed students snacks after school, through the Backpack program and over school breaks. This year, the BGCG took over administration of the Summer Food Service Program, providing food to people at three sites in Geneva during the summer. Now, the Club has been able to take these efforts to new levels by providing dinner to more than 35 kids a night, every week night at the Geneva Community Center. Many of the kids go to the community center directly from athletic practices – and are more than ready to “refuel.” The dinner program is funded through the School Innovations Fund, another grant opportunity through the Club’s partnership with the Geneva City School District. 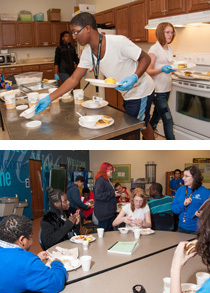 “These monies provide a ‘wrap around program’ for high school students to provide educational support, a healthy meal and social recreation to promote positive social skills and interactions,” explains Arlene Francis, executive director of the Boys & Girls Club of Geneva. Reinforcing the Boys & Girls Club’s Healthy Habits curriculum, these nutritious meals are made with pride by the young people working side-by-side with staff. The kids are learning to cook healthy, balanced meals and are enjoying the camaraderie of cooking in a group. The Club is looking to continue to build on this effort to teach more kids healthy, nutritious habits that will last a lifetime while feeding them in the short term. A tree nursery at the Geneva Community Center is being designed in an effort to further children’s environmental literacy while improving the local environment. The initiative was the brainchild of Dan Budmen, a junior at Hobart and William Smith Colleges, who was awarded the HWS Centennial Leadership Fellowship in the amount of $5,000 to design the nursery. Budmen volunteers with the Seneca Roots & Shoots organization – the local chapter of a children’s environmental organization started by Jane Goodall – that meets at the community center. He submitted a proposal to design and construct a greenhouse. Budmen, members of the organization, and HWS Colleges community members erected the greenhouse during HWS Day of Service, October 19, and plants were moved in by Roots & Shoots children on Friday, October 25. All of the pots and seedlings the group had cultivated were moved in to the greenhouse and some new ones were planted. They then sat down in the greenhouse, among the pots, and read about the trees and how vital they are. Lessons in the environment, the history of trees in the Finger Lakes, research on local tree species and a history of local nurseryman William Smith will help develop children’s environmental literacy throughout the year. Nan Crystal Arens, associate professor of geoscience at HWS who oversees the local Roots and Shoots group, explains the trees then will be planted within the Geneva area as part of a project aimed at “habitat restoration within the city, where erosion and degradation have occurred, such as along Castle Creek.” “The trees that will be planted in the Finger Lakes region are very similar to the kids who will be growing them, unique. Through the growing of trees, students will learn to respect individuality and the environment, both the social and the natural, in which we all exist,” says Budmen. The aim of Roots and Shoots is to develop the human community, environment and animals. Arens explains they work with elementary students to cultivate and nurture the natural environment while also improving children’s comfort level with nature: “We use structured activities like the planting and gardening as well as spontaneous, imaginative play to do community building, get them to know each other and appreciate their differences while realizing that it’s okay to get mud on your shoes, that frogs are cool to watch and you can play with a stick – things that modern life doesn’t always permit on a large scale.” See the Roots and Shoots at GCC photo gallery. 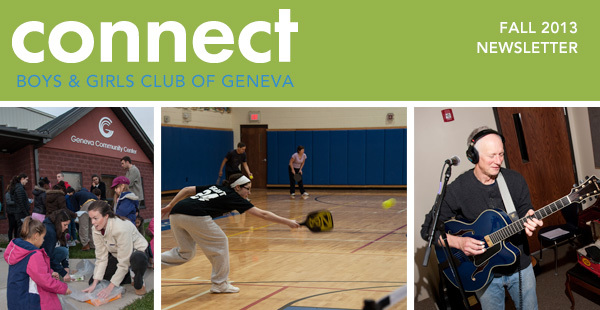 The Boys & Girls Club of Geneva has forged a new partnership with Geneva Community Radio (GCR) an independent, non-profit and community supported radio station. 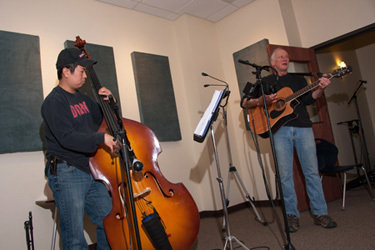 As a result, the station relocated its operations to the Geneva Community Center in September. 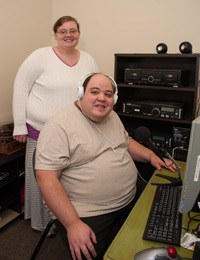 Station Manager Jason Longwell, in writing about the partnership on the station’s blog, noted: “This partnership will ensure a sound and secure future for the radio station and will present new opportunity for youth, teens and other members of the Geneva community to produce new and existing radio content… We are very excited about the potential for this partnership.” At the moment, Geneva Community Radio is strictly an internet radio station, which can be heard via genevaradio.blogspot.com. However, its partnership with the Boys & Girls Club will assist in the management’s ultimate goal of creating a low-power FM station as the Club will act as the licensee of the proposed station. GCR broadcasts diverse programming from around the world and within Geneva. 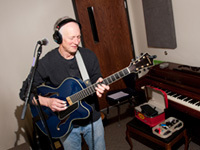 The station can be reached via email at Genevaradio@yahoo.com, or by phone at (315)308-4272. See the Boys & Girls Club of Geneva 17th Annual Dinner photo gallery.